Breakfast food is pretty popular around our house. In fact, one of the first things my girlfriend and I discovered we had in common was a love of breakfast food at pretty much any time of day. I have my grandparents and all the late night truck stop runs they brought me along on to blame. And as we all know, the only thing better than making a big platter of eggs, hashbrowns and bacon is having someone else do it. That way you can eat it while it's hot without having to make the french toast that the kids want. Cracker Barrel is a good place to be at times like this. I like quirky places, and Cracker Barrel definitely qualifies. First of all, the decor is totally unreal. It's like they went to rummage sales in rural towns and bought everything they could lay their hands on for wall decorations. Second, half the building is a store selling candy, toys and various gift items. 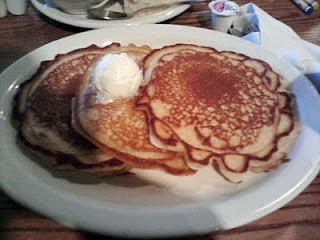 On our most recent visit, most of us were craving pancakes. My girlfriend was the exception, ordering what I've come to think of as the Anti-Atkins breakfast, called "Grandpa's Country Fried Breakfast" on the menu. This has to be the breakfast of choice for starch fans. 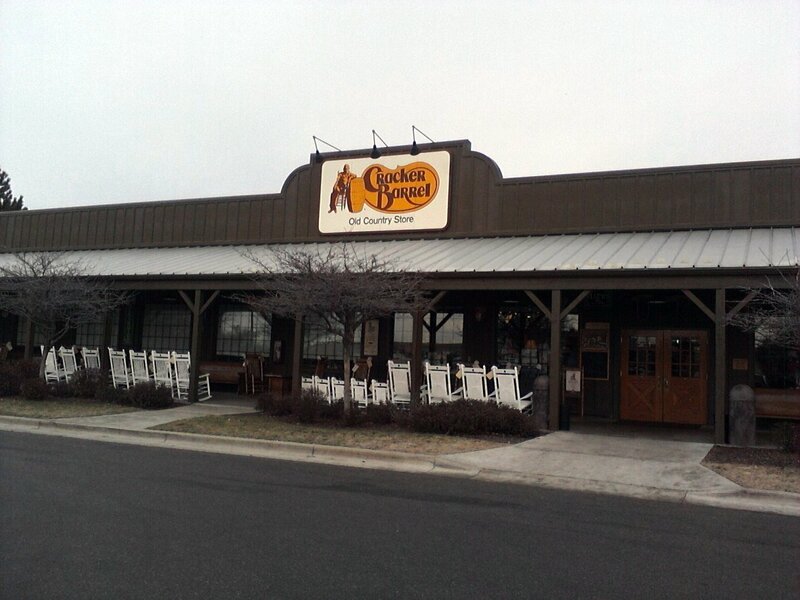 Two eggs, grits, gravy, buttermilk biscuits, hashbrown casserole and chicken fried chicken or country fried steak. You can get fried apples instead of hasbrown casserole, but it's not really in keeping with the theme. 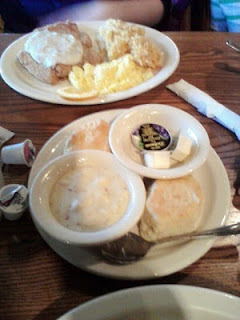 This was the breakfast I had the first time I visited Cracker Barrel, and I didn't really eat anything else for the rest of the day. It's frankly a little horrifying. It's also delicious. Well, maybe not the grits, but then I'm just not a grits kind of guy. My lady doesn't really go for them either, leaving them off to the side the same way I used to leave that little sprig of parsley that restaurants seemed to like adding to plates when I was a kid. The kids ordered off the kids menu, which you'll know is limited if you're at all familiar with breakfast places. I decided to go with the special that was being pushed that day, "Momma's Pancake Breakfast": three buttermilk pancakes with fruit topping or natural syrup, two eggs and a choice of bacon, turkey sausage or smoked sausage (I went with the latter). Eggs are eggs, all I ask is they not be too moist or bland, too dry or too wet, and these were pretty close to perfect. The sausage was a definite surprise, much smokier than I was expecting but definitely a good thing. I shared it around the table a bit and the response was favorable all around. But undoubtedly, the best part of the meal was the pancakes. I like pancakes enough that I don't discriminate much by type, but I do have preferences for the cooking style. I like them fluffy inside and a little crispy on the outside, and these were very good. 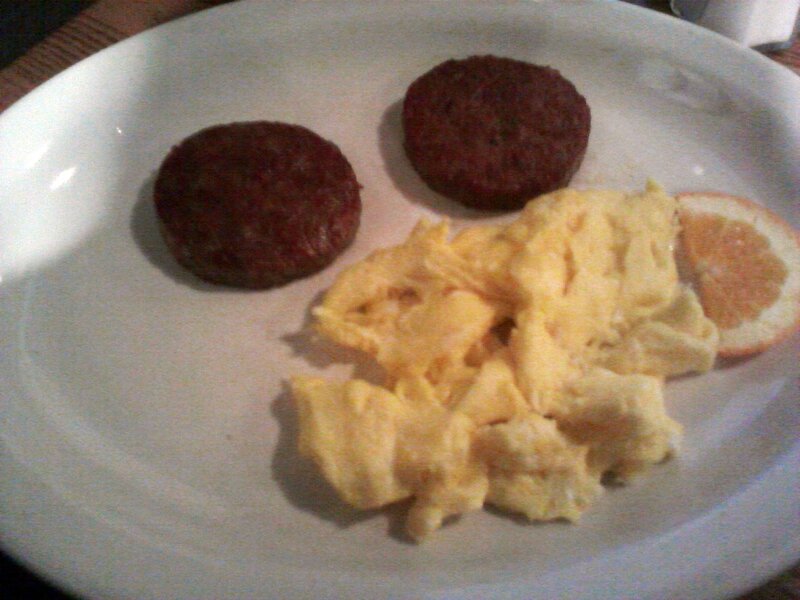 Like my girlfriend, I have found my favorite Cracker Barrel breakfast. But there's a little more to tell. No, it's not an airplane bottle of booze. If you order syrup with your pancakes, they bring it to you in an individually-sized, warmed bottle. The syrup is good enough that the toddler tried to drink the dregs of her bottle after she was done eating. 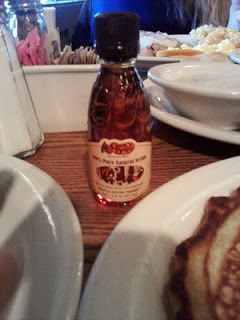 The only thing I don't get is that regardless of whether you get a stack off the adult menu or a single off the kids menu, you get one and only one of the little syrup bottles. Luckily, the pancakes were so good that one bottle was enough. Yes it's a chain, and yes they push the atmosphere (and the trinkets) pretty hard, but the food is worth it.